Run time: 1 hour 28 minutes. What gets in the way of the good in our lives? Can you say your life is good? If not, what is not good? Is there anything you can do to change it? 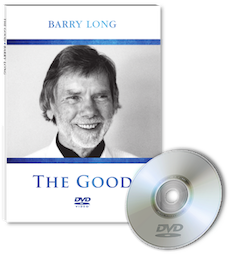 Participate with the audience as Barry Long guides you towards the good as the sensation of the living truth inside you. Later he answers questions about how to keep in touch with that reality - how to stay with the living truth in a busy world. Barry's message: Give up wondering... And rediscover the wonder of life. A DVD, filmed at a talk given by Barry Long on 19 May 1989 at The Victoria Rooms, Bristol, UK. The earliest video footage of Barry Long teaching. Running time: 1 hour 28 minutes. Released: September 2014 [Previously issued as an extract from The Barry Long Archive with limited distribution in 2009]. Life is immediate and immediately fulfilling. Living - with its complications and problems, past and future - is what distracts us from life. The message is simple, but easily overlooked. 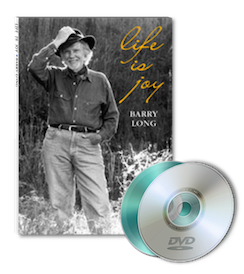 Speaking with passion and humour at The Master Session 2000, Barry Long delivers the message simply and straightforwardly, and brings you back to the inescapable truth of life. This two disc set ( DVD and CD) is from a talk given on 8 November, 2000 at 'The Master Session', Cabarita Beach, NSW, Australia. Note: Some recordings of Barry Long do not fall into the above categories and therefore will have descriptive titles for example: The Myth Of Life Series on CD are described as "Audio books" (these were not recorded from live meetings but written and read by Barry) or the DVD title - The Good - "filmed in Bristol UK 1989" (no specified session number or date recorded).